On this week’s brand new edition of Rapidly Rotating Records, we’re going to be bashful and shy, we’ll listen to the “banned” and have some scary spooky Halloween themed records. 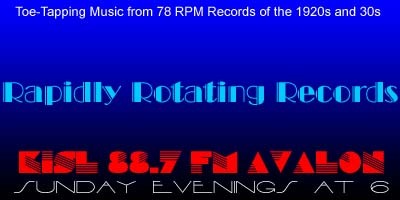 And, there are several 78RPM records making their Rapidly Rotating Records debut on tonight’s show. Bashful Baby – Aby Lyman’s California Orchestra / Phil Neely, v.
Bashful – Hollywood Dance Orchestra (Adrian Schubert) / Irving Kaufman, v.
So Shy – Isham Jones AHO / Eddie Stone, v.
Radio Times – Henry Hall and His BBC Dance Orchestra / Dan Donovan, v.
Let’s All Be Fairies – Durium Dance Band / Fred Douglas, v.
Princess Poo-Poo-Ly Has Plenty Pa-Pa-Ya – Abe Lyman and His California Orchestra / Rose Blane, v.
Swamp Ghosts – Wayne King AHO / Burke Bivens, v.
The Haunted House – New Mayfair Dance Orchestra / The Three Ginx, v.
Skeleton In The Cupboard – Teddy Foster and His Kings of Swing / Teddy Foster, v.